Sagrada Familia is a large Roman Catholic church in Barcelona, Catalonia, Spain, designed by Catalan architect Antoni Gaudí (1852–1926). Although incomplete, the church is a UNESCO World Heritage Site, and in November 2010 was consecrated and proclaimed a minor basilica by Pope Benedict XVI. The nanoblock Sagrada Familia set comes in a small box packaging, with over 550+ pieces of building blocks, and a sheet of instruction paper to show you how to build it. The blocks and instruction paper. That's over 550+ blocks. This is a "Level 4" nanoblock set, so it's moderately difficult to put together. It took me around 50 minutes to put it all together. The main challenge in building this nanoblock set is dealing with lots of tiny blocks. Here are some pics of the build process. And here is the fully assembled Sagrada Familia. It stands at about 12cm tall. 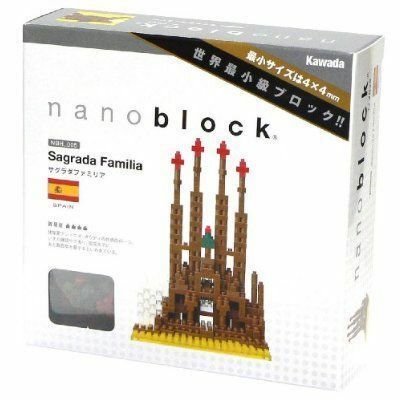 The nanoblock Sagrada Familia set retails at RM69.90, and you can get them from Toys R Us, Action City, Kinokuniya, Popular Bookshop and XL Shop in Malaysia now. You can also find it in my Amazon.com store.